You have been paying your insurance premiums to protect yourself from the event of an accident or loss. Despite this, when the unthinkable happens it can be very stressful, even when it is something minor. Knowing you have insurance can provide some comfort when you experience loss or damage from an accident whether it is your home, your car, or business. Knowing what to do when you need to file an insurance claim will help you get through any disaster, large or small. Call 9-11There are several situations where calling 9-11 should be your first step. This is especially important if you fear a crime has been committed or is still in progress and of course if you are at the scene of an accident where someone might be in need of immediate medical attention. If others are present, especially in the case of a car accident where tempers might flare, be courteous and avoid arguing. Wait for the police to arrive. Don’t discuss settlementsIt can be tempting to be helpful and discuss the accident with the other driver or drivers. This is ill-advised. You should only discuss the incident with the police and/or your Insurance Claims Team. Take notes and document the incidentIn the world of cell phones, it is easier than ever to document an incident. You can get full details including images, interviews with witnesses, and other pertinent information using your phone. Note the date and time as well. If there are witnesses, get their contact information. You can also record their testimonial. Take photos of anything that will help support your case including the scene of the accident. Severe injuries to yourself or damage to your car might make it difficult to move out of the line of traffic. If you can, move to the shoulder. If you can’t move the car, switch on your hazard lights to help other drivers see you. Turn off your engine and make sure your car is parked. Set the hand brake if you drive a manual. Calm yourself down and avoid jumping from your car. If you wish to leave the car, check that it is safe to do so. If you are able to, check to see if others are injured. Then call 9-11. Water in the basement poses the risk for electrical shock. Never go into the basement if you know or suspect the water is high enough to come into contact with electrical outlets, baseboard heaters, your furnace or electrical panel. When in doubt, stay out. If you have access to your main breaker switches away from the basement you can switch this off for safety. If you have natural gas appliances located in a flooded area, do not enter the area. Many people do not realize that these also pose a potential electrical shock hazard. If you suspect there has been a burglary, do not enter the house. Call the police and wait for them to arrive in a safe place such as your car or your neighbour’s house. Once the police have established it is safe to enter, look to see what has been stolen or damaged. Make a list and in the case of damages, take pictures. If you are making a claim do not throw out any damaged property, as your insurance company will have to see it. Do not be worried if you do not have somewhere to stay when emergency accommodation is needed. Your insurance company will assist in finding a safe place to stay, and in most cases, your policy should cover this. In stressful times it is easy to lose your head. It can also be hard not to admit fault in the case of an accident out of guilt when you see you have injured someone, or have caused damage to their vehicle. It is very important to try to stay calm and not discuss what has happened with other parties. Never admit fault or liability even if you are 100% certain you did cause the accident. Do not discuss settlements and instead say your insurance company will be in touch. Once handed over to your insurance company or even to a lawyer, do not get involved in negotiations for settlement or in any legal proceedings unless expressly asked by your representative. Experiencing loss and damages to your home, car and belongings can be a devastating experience. Having the right insurance coverage is designed to protect you in these events. Your insurance company is there to provide assistance and advice, and to walk you through the steps to getting your compensation. Following these steps will ensure nothing interferes with the claims process. 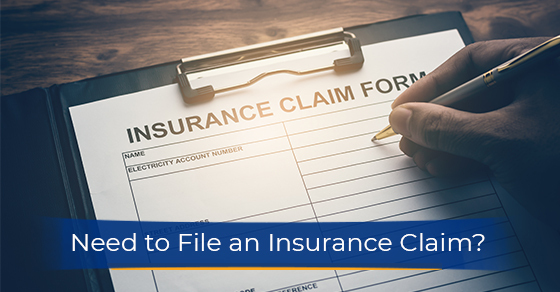 If you would like more information about filing an insurance claim, call WB White at 1-877-727-0757 or contact us here.